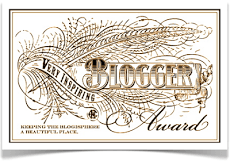 I was incredibly humbled to be nominated by Jane Thrive of Survive, Live Thrive for the Very Inspirational Blogger award this week! Thank you! link where they may be found. Whitney Lang Fleming of playdatesonfridays. The most recent post I found inspirational from Whitney was called “Can Positive Intent End the Mommy Wars“. It urges mommies (like myself) to take a step back when we think we’ve been wronged and try to look at it from a positive angle. I try very hard to put this into practice in general – but especially with my interactions with my ex. Mandy Walker at Since My Divorce. You all might have seen the discussion that I had with Mandy about my own divorce in a series she did last month. Mandy’s advice to the recently separated and divorced is built on her own experiences – and it’s spot on. Kerri from Undiagnosed but Okay. Kerri’s daughter Bridget (who, I have to say is cute as a button), has only recently been diagnosed with PACS1. Her journey to diagnosis and continually positive attitude is truly inspirational. Now that she finally has a diagnosis – she’s going on a new journey – to support other parents of children with PACS1. I would be remiss if I didn’t mention Lizzi Rogers from Considerings, Life in Silver Linings. Her positive attitude and amazing smile always make my day. As I’ve written before – Lizzi is the inspiration behind the #1000Speak for Compassion Movement. Julie from Julie’s Fabulous Life. Julie and her ex-Andrew have recently separated – and their co-parenting relationship is the stuff of legend. I am absolutely in awe of their ability to get along for their children’s sakes. The Cuckoo Mama from This Cuckoo’s Nest (on DivorcedMoms.com). Similar to Julie, although CM’s ex is a bit of a dolt sometimes, she and her ex have worked out a nesting situation that drives them both crazy – just so their kids won’t be displaced by their divorce. German husband while raising three trilingual children. If that’s not inspirational, I don’t know what is. Kathy Radigan from My Dishwasher’s Possessed. I actually had tears when I read about her Special Needs Princess. I don’t want to spoil the ending – but check it out. Annah Elizabeth from The Five Facets. Annah writes about spirituality and inspiration and healing. She’s all about giving – and recently paid it forward in the form of school supplies to five inspirational teachers. #1000Speak for Compassion. I am a proud member of this movement – and I’ll be posting my own story next week on February 20th – along with over ONE THOUSAND other bloggers. Similar to Whitney Lang Fleming’s positive intentions – we’re trying to flood the internet with a positive vibe and spark discussion and positive action. The anti-anti-vax movement. I’m lucky to live in a part of the country where we have almost full compliance with vaccinations – which puts my children at far less risk than those who live in states like California. I have been repulsed by the awesome displays of ignorance coming from the anti-vax movement – and I’m glad to see the anti-anti-vax movement is making some strides. I came across this tongue in cheek article last week (in a Canadian paper of all places!) – but it makes some excellent points. And if you haven’t seen it, you should also have a look at this YouTube video on herd immunity if you’re still not convinced. My children are a constant source of inspiration. Puck has worked really hard and is overcoming his difficulties with his learning disability. Flower is chugging through Grade 1 and her reading is improving day after day. Even Bae – over the past week or so he appears to be overcoming his reluctance to speak. He called me mommy the other day and gave me a big kiss.